Napoleon had invaded Egypt in 1798, and then left the following year having defeated all Ottoman attempts to expel him but otherwise achieving little of political or military consequence. Having supported the Ottomans in their fight with Napoleon, Britain now decided to expel the French themselves. This came at a time when the British army was at a low ebb. Various failures in the previous few years meant the army was not well regarded, and it continued to be pained by the failure to retain the 13 North American colonies two decades earlier. In the event the campaign in Egypt was entirely successful, and it only took five months from March 1801 to force all French forces in the country to surrender. By the time the first troops set foot on the sands of Egypt just about all the classic aspects of the Napoleonic uniform were in place. The coat had become fully closed and without lapels, and the bicorn and tricorn hats had given way to the shako. However this is not the uniform seen on these figures, and nor should it be. The British Army had plenty of experience of operating in hot climates, and while the shako was certainly worn by many the much more practical brimmed round hat was also widely worn, particularly by those troops arriving in Egypt from India. This hat has been well illustrated on the box, and every figure in this set wears one, but it has been poorly modelled as it is a little too tall and narrow. The coats are fine, and bear wings on the shoulders, revealing these men to be grenadiers rather than battalion men (each British battalion had 10 companies - eight 'battalion', one grenadier and one light). Given the disparity in numbers we would have preferred battalion men instead, but as grenadiers these figures are still correct. Some of the men have gaiters up to the knee, which is regulation and fine, but others have looser trousers, which like the hats were widely adopted as more comfortable and helped protect the breeches. They all have a bayonet, haversack and canteen on the left hip and a cartridge pouch on the right, all held up with straps across the body. This is all accurate, but things go wrong when it comes to the knapsack. Initially the men were ordered to leave the knapsack behind during the landing, and instead carried a rolled blanket across the back. None of these figures has this, which is a bit disappointing, but half the poses do have a knapsack. This is correctly held by two straps over the shoulder but is secured by two straps that run along its entire height, which is a feature of later designs and had yet to be invented during the Egyptian campaign. The Strelets sculpting style delivers rather thick details, and in particular the various straps on the body effectively obscure almost the whole of the coat. Although the bayonet scabbards are thinner than some recent Strelets sets the muskets are far too thick, as are some other details, and the faces are not particularly good either. The lack of any flash is a much more positive feature of these figures, as is the lack of excess plastic, although that has been achieved at the price of good poses as usual. The poses are quite flat but largely follow what we would expect from Strelets. There are firing and advancing poses along with some marching ones which suffer particularly from the broad muskets, causing them to be pressed deep into the face of the poor soldier. Still the basics are all here, but what is missing is any form of officer, musician or other specialist. 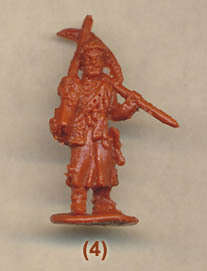 This is a common feature of the Strelets Mini series, but the only suitable figure is currently that in the Hat Peninsular British Infantry set. One very minor detail is that several of the men exhibit no sign of the queue, although this could be tucked under the hat. Apart from the knapsacks there are no accuracy problems here, although the sculpting does leave a good deal to be desired. The poses are uninspired but adequate for most, although the choice of depicting grenadiers is surprising (however with patience and skill the wings could be trimmed into tufts). Since they wear round hats these figures could also serve in other foreign stations such as the Caribbean, which is useful, but there is nothing about this set to get excited about.